The Inverness Cooter Festival is a musical celebration in honor of the native Cooter turtle. Part tradition, part legend, with a little bit of crazyness thrown in for good measure. This three day music festival draws an estimated 12,000 attendees to listen to classic rock and roll from the 60's, 70's and 80's. 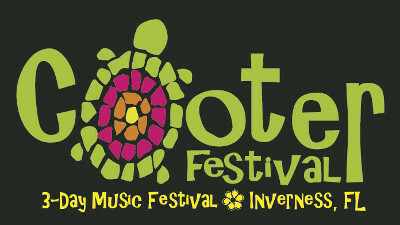 Held in Inverness along the shore of Lake Henderson, the Cooter Festival occupies Liberty Park and Wallace Brooks Park. Live musical entertainment, featuring a number of different bands, is on stage at Wallace Brooks Park along with a food & beverage zone. The park also includes an "Adventure Zone" where you can try out hang-gliding, flyboards or paddleboards. Liberty Park hosts the "Wild Cooter Carnival", arts and crafts vendors, and additional food and drink vendors. The two parks are only a short distance apart ... connected by the multi-use Withlacoochee State Trail. In addition to an impressive musical lineup, the festival features hourly "Cooter" turtle races, carnival rides, street performers, a wildlife exhibition, and water sports shows. The fun begins on Friday with a "Zombie Run" - a mad scramble where runners try to navigate an obstacle course while evading "zombies". On Sunday the festival celebrates "Cooterween" - with a costume contest and a scavenger hunt. The "Cooter Cove" area hosts a number of V.I.P. events during all three days of the festival, including exclusive ticketed events like VIP parties, a craft beer experience, a costume party, and a barbecue contest.